Why Aren't There More Higher Ed Programs Behind Bars? 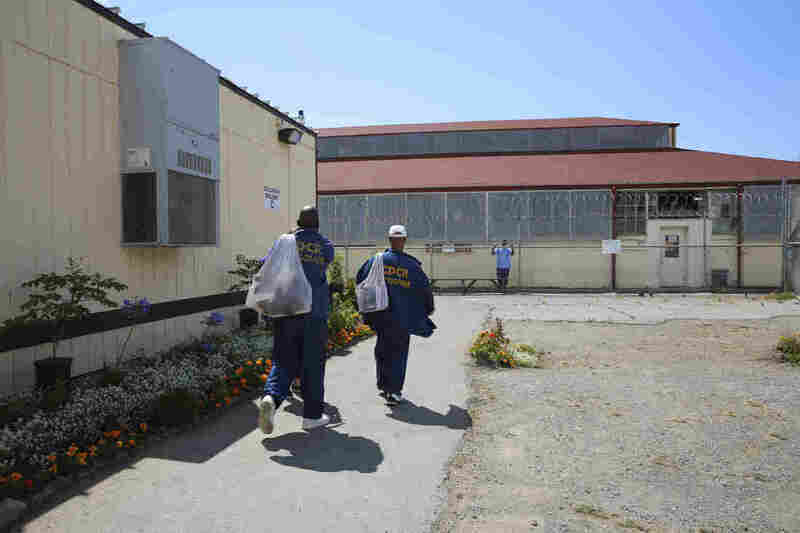 : NPR Ed San Quentin prison's university gets high marks. But few prisons in the nation are following the California model. With mesh backpacks slung over their shoulders, inmates walk to school at San Quentin State Prison. Inmates have the chance to earn an associate of arts degree here through the Prison University Project. America, by far, has the highest incarceration rate among developed nations. The rate of imprisonment in the U.S. has more than quadrupled in the last 40 years, fueled by "three strikes" and mandatory-minimum sentencing laws. Studies show that prisoners who get access to education behind bars are far less likely to return to prison, are are more likely to land a job once they're released. But few of America's crowded prisons have higher education programs that reach inmates face-to-face. One exception is San Quentin State Prison on the eastern edge of the San Francisco Bay in Marin County, Calif. While the prison has a nasty national reputation, the fact is that some inmates want to get transferred to San Quentin to access its university, with volunteer teachers from top schools. 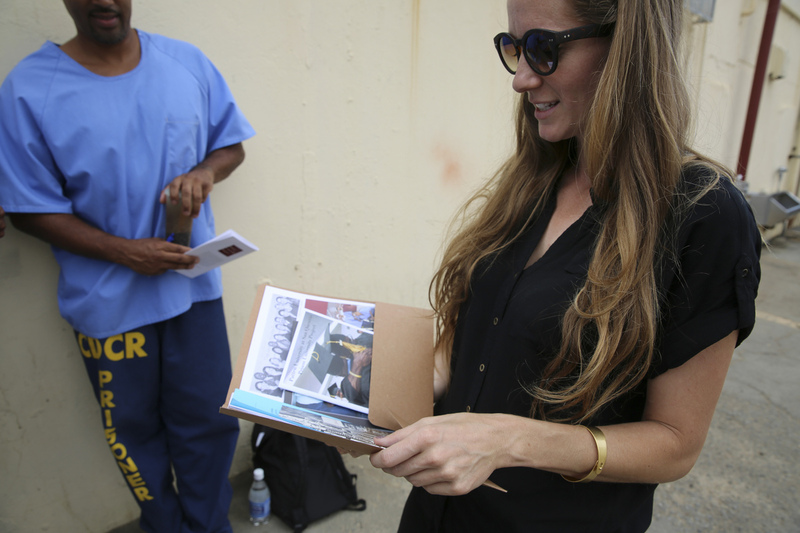 In a small trailer on the edge of San Quentin's main yard, volunteer teachers Lexi Fenton and Aaqilah Islam want to hear from the student-inmates about their final papers, and what they got out of the child psychology course as the semester wraps up. Volunteer teachers Lexi Fenton and Aaqilah Islam hear from the student-inmates about their final papers, and what they got out of the child psychology course. "I can use episodes from my life to place myself in each one of the stages Erikson spoke of," one inmate responds. "The primary one being, the one I'm trying to write my paper on, is the first stage of trust [that] infants experience." "Let's talk a little bit more about family structure," Fenton tells the class. Another inmate chimes in. The course, he says, helped illuminate what "helped lead a lot of us down a path toward prison ... Without those needs being met as I wrote in my paper, it can stunt their growth." 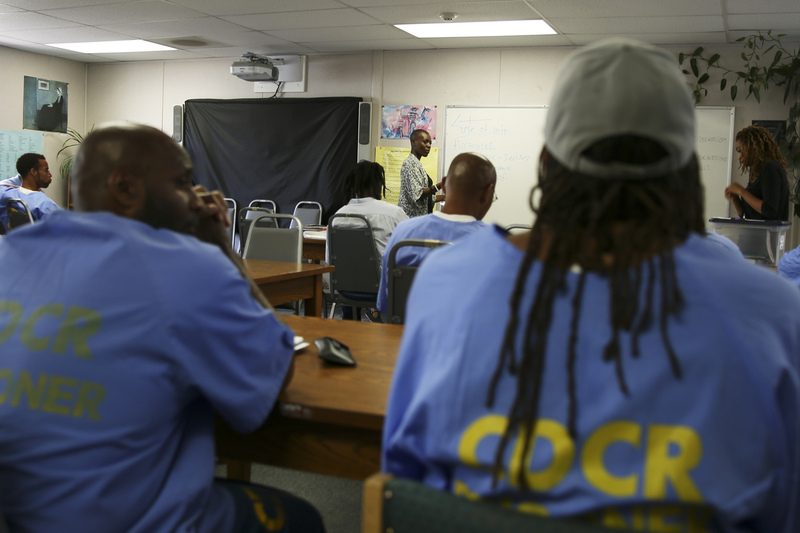 The class is part of the Prison University Project (or PUP), the only onsite degree-granting program in California's sprawling penal system, the nation's second largest. Today there's a waiting list to enroll. Jerome Boone, 37, is serving a 15-year sentence for drug possession and distribution. He admits that, at first, he starting taking classes just to pass the time. "Just the more I learned, the more I came. I dunno, it just started opening up doors," he explains. "I was just able to see that there was a bigger story out there than just what I was telling myself. It just changed my life." In June, Boone earned his associate degree through PUP and the program's partner, the small for-profit Patten University. He's up for parole in 2018. He hopes to work in the counseling field. San Quentin's program uses no federal or state money. It's funded entirely by private donations. More than 100 professors from the University of California, Berkeley; Stanford; San Francisco State and other schools donate their time. Inmates pay no tuition or fees. PUP supplies everything from books to pencils. It might irk some that convicted felons are getting a free education with these professors from top colleges when ordinary, law-abiding people are racking up massive debt and struggling to pay for school. Boone says he understands that. But, he adds, society has to understand something. Left: Phoeun You earned his associate degree in June. Right: Jerome Boone earned his associate degree in June through PUP and the for-profit Patten University. "The better we do in here, the better we are when we exit," he says. "If we come in here and just stay the people we are when we come in, you know, without any growth or insight or any opportunity to better ourselves, we're gonna get out that same person." And more inmates across the U.S. and here in California are leaving prison. The U.S. Sentencing Commission last year approved a process to reduce sentences for some nonviolent drug offenders. And in California, court orders to reduce overcrowding means more lifers and "three strikers" are going home. "That has provided a lot of hope around here. Guys are working incredibly hard to go home. And I think they should," says Kara Urion, a program director with PUP. "At a lot of prisons where these guys have been, they've spent the majority of their time locked down. And the available programs have consisted, maybe, of NA [Narcotics Anonymous] and AA [Alcoholics Anonymous]. So San Quentin is really unique in that way." PUP program director Kara Urion (right) reflects on last year's graduation with graduate Jerome Boone. Prison education in much the rest of the country remains a patchwork of distance learning, ad hoc tutoring or GED programs. And quality higher ed prison programs like San Quentin's remain rare. There is Temple University's Inside-Out program, Bard College's Prison Initiative and a few others. But programs like these have proved hard to replicate, experts say, because of a lack of money and political will since congressional action effectively shut down prison higher education in America. "The Pell Grant ban 1994 really just decimated college programs in prisons," says Marc Mauer, who directs the advocacy group The Sentencing Project. "Today, you can count on two hands the number of colleges or universities that are providing any kind of significant programming in prisons around the country. Nothing has scaled yet. It usually comes down to resources." PUP's all-volunteer teacher model grew in reaction to the federal funding cut two decades ago. 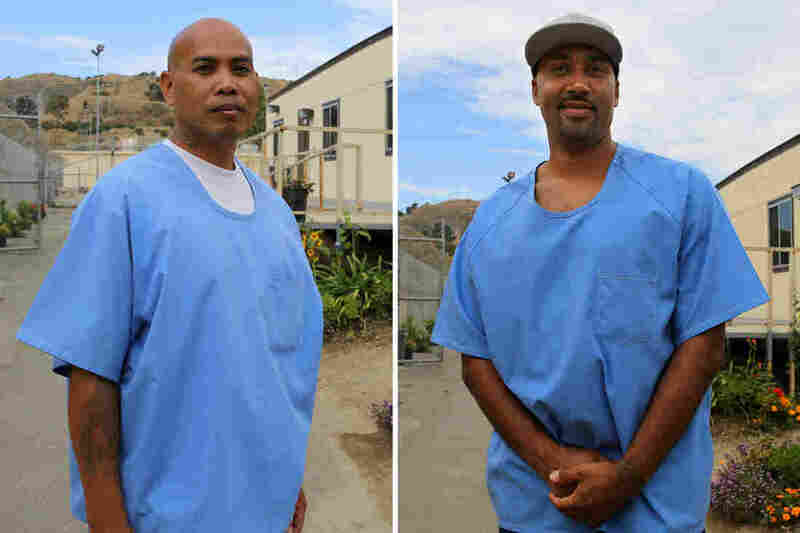 Organizers hope to expand the program to other prisons in California. But executive director Jody Lewen says, "It's incredibly labor-intensive and requires an enormous amount of diplomacy ... It's like welding under water. Everything is slower." President Obama has recently begun to emphasize prison and sentencing reform. He recently launched one effort to restore Pell grant funding through a small, research-based pilot project. But some advocates say it's a tiny step. Even for a small investment, the potential payback to society is big, says RAND Corporation senior researcher Lois Davis. Her research has found that participation in any level of education behind bars reduced risk of being re-incarcerated by 13 percent. "For every dollar invested in a prison education program it will ultimately save taxpayers between four and five dollars in re-incarceration costs," she says. "So you are really are achieving substantial cost savings." Student-inmates discuss realms of consciousness in an introduction to philosophy class. Prison University Project's Lewen says the program is looking for a new collaborator since its accredited partner Patten University, was bought up by the for-profit startup University Now. "We would like to find a new partner better aligned with our values and our mission," Lewen says. "Maybe there is such a thing as an 'amount' of consciousness, maybe one creature be more conscious than another?" says U.C. Berkeley doctoral student Adam Bradley as he leads the discussion in an introduction to philosophy class. An inmate chimes in: "One of the problems I had for this class is that it didn't have a concrete definition of consciousness." Inmates' hands go up and a spirited debate ensues. The philosophy class has been one of 41-year-old Phoeun You's favorites. Incarcerated for more than 20 years, You has an intense gaze and a black tattoo on his neck that reads, "The Killing Fields." It's a reminder of the Khmer Rouge butchery in his native Cambodia he and his family fled when he was a little boy. "The genocide in my country. It's the reason why I'm here in America today." The reason You landed in prison is also a story of senseless killing. Alienated and failing out of school in Southern California, he joined a gang called the Asian Boys. "On March 23, 1995, I committed murder," he says. "Did a drive-by shooting on some rival gangs. I thought it was a rival gang. I shot into a crowd. Killed one guy and hit four others. So I was charged with murder and four attempts." Serving 30-to-life, You has already spent his 20s and most of his 30s behind bars. He says he started to feel daily "like the air had been sucked out of me." He was losing hope. But he had a record of good prison behavior. He noticed that the inmates in the university project had more energy. A spark, he calls it. 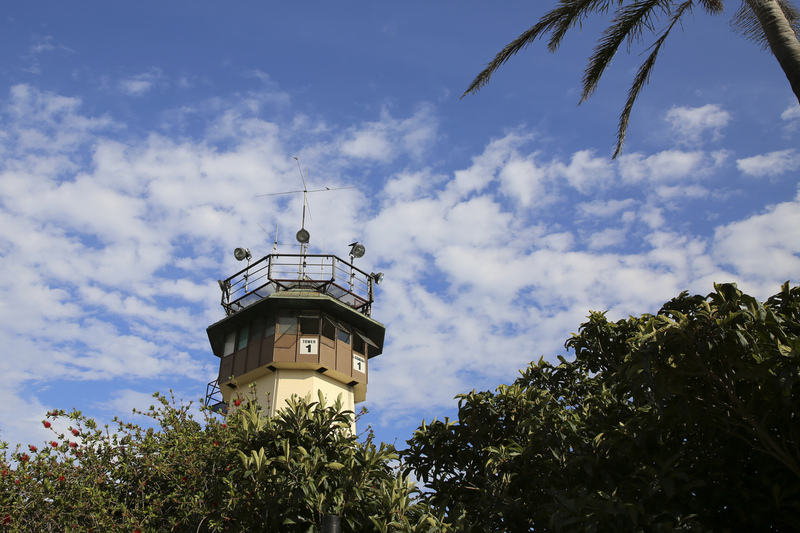 The watch tower looms over San Quentin State Prison in California. It was a long, six-year haul with lots of remedial work. But this June, You earned his associate degree. "Yes, I'm physically incarcerated," he says. "But one thing I took out of school is, my mind don't have to be incarcerated also. And one thing people can't take is my knowledge. That's my power, that's my empowerment." You's first shot at parole is still 10 years away. He'll be in his 50s. The convicted murderer is a realist. Still, he hopes to one day get out and work, counseling ex-gang members and at-risk youth. He says he found that spark. Since the program began in 1996, 140 inmates have completed a degree through PUP. Dozens more have taken classes but were paroled before they finished. Men take about four years on average to complete degree work and the majority spend at least a year in the college prep program. How successful is PUP? By the only measure currently tracked, recidivism, PUP is doing pretty well. In California, about 65 percent of released prisoners return to prison within three years, says PUP executive director Jody Lewen. The rate for PUP participants "was 17 percent after three years," she says. "And none was for a violent crime."